If you live in or around NYC, I don't care what your plans are for tonight, 08.16.14 - there's no way they trump what's going down at Scumbags & Superstars "Mid Summer Melee." 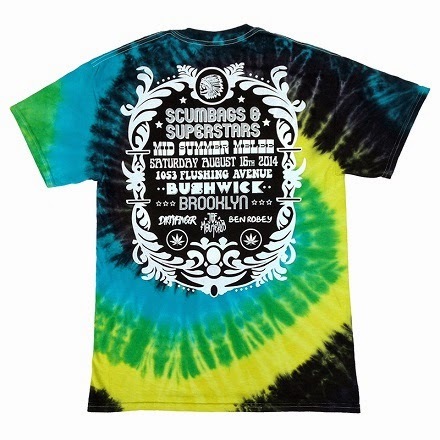 If you 21+, the purchase of this groovy t shirt and ticket package will grant you admission to their party in Brooklyn. The $50 purchase will also score you free BBQ, ice cream and unlimited beer. The pre-party starts at 7pm with Justin Angelos' solo art show; followed by the "Melee" which officially begins at 9pm and doesn't stop until 3am. Sounds like its going to be amazing. You can still grab the shirt and tickets in advance through the Scumbags & Superstars online shop, and visit Facebook for more details about the event. Damn, I wish I could make it. 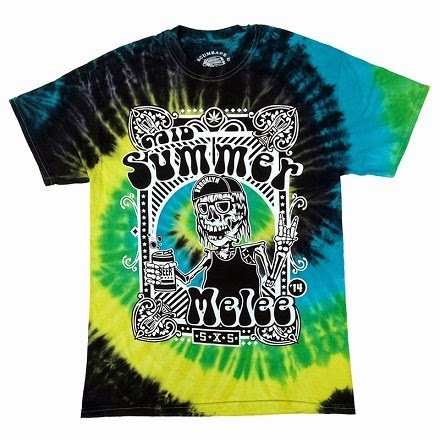 UPDATE 08.17.14 The party may be over, but this tee can still be yours for $20.